The beginnings of the B'nai Israel Congregation date from the first decade after the Civil War. On April 12, 1873, the congregation met at its regular place of worship, 81 North Gay Street (in what is now the vicinity of Gay Street and the Jones Falls Expressway), and established a Board of Trustees. Ten days later, the eight-member board appeared before two justices of the peace and signed their names to a certificate of incorporation. B'nai Israel's charter was approved by the Supreme Bench of Baltimore City and filed in court records on April 30, 1873. It is uncertain how long the congregation was in existence prior to drawing up a Certificate of Incorporation; however, 1873 has long been considered the date when B'nai Israel began. The original name of the shul was the "Russian Congregation B'nai Israel of Baltimore City." According to one source, B'nai Israel originated when dissension led a group of members to withdraw from an earlier synagogue, Bikur Cholim, to form their own congregation. No supporting evidence is presented for this claim, and since B'nai Israel purchased the former home of Bikur Cholim five years later in 1878, there is every reason to believe that an amicable relationship existed between the two congregations. B'nai Israel may have originated when Jews living in close proximity started davening together for the sake of convenience and later formed a shul. 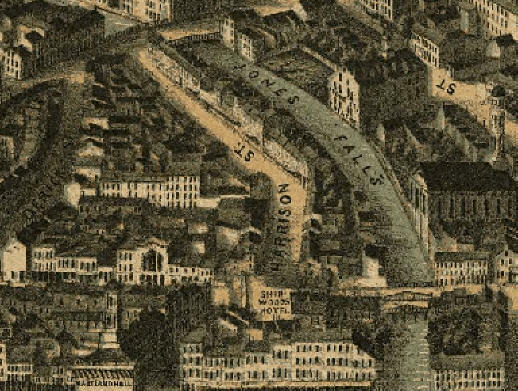 A majority of the original B'nai Israel board members lived on Harrison Street, just west of the Jones Falls. 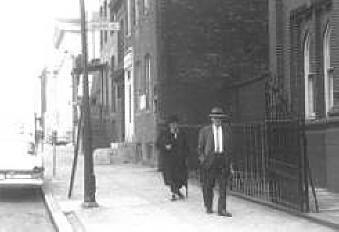 While Harrison Street no longer exists, it was once the heart of Baltimore's Jewish community. 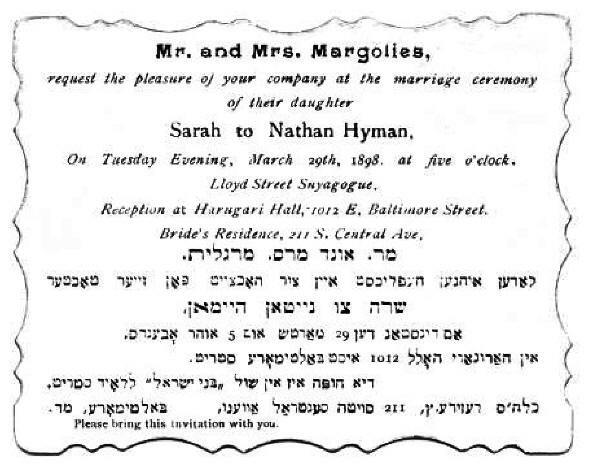 The Baltimore Hebrew Congregation held services at Harrison Street and Etna Lane for eight years prior to building Baltimore's first synagogue on Lloyd Street in 1845. A second congregation, Beth Hamedrosh Hagadol Cluas, also met on Harrison Street, but these congregations were made up of German Jews, as opposed to the Eastern European Jews that formed B'nai Israel. These are the names of the founders of the B'nai Israel congregation: Joseph Hyman, Louis Sakolski, Samuel Freidman, Bernard Schiller, Julius Sachs, Joseph Stein, Jacob Nathan and Samuel Bartz. 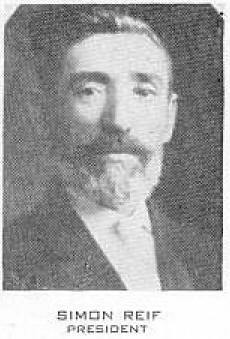 Joseph Hyman, the first president of the shul, is listed as a shoemaker in Baltimore City Directories. He lived at 12 Harrison Street. Other members of the Hyman family, including David and Koppel, appear in early articles about B'nai Israel. The Hyman family has long been involved in the congregation. David S. Hyman chaired the 100th anniversary banquet in 1973. Judi Tepperman, David Hyman's daughter, served as recording secretary for B'nai Israel for many years in the late twentieth and early twenty-first century. Louis Sakolski was in the clothing business and lived at 65 Harrison Street. He was the secretary at the first recorded meeting of the congregation. Samuel Friedman and Bernard Schiller were both in the clothing business and lived on Harrison Street, as did Julius Sachs, a peddler. Joseph Stein and Jacob Nathan were both glaziers and are listed at 8 Broad Alley (near Lombard and Exeter streets). No listing could be found for Samuel Bartz. Another early member of the congregation was Julius Krulewitch, a shoemaker, who lived at 23 Harrison Street. 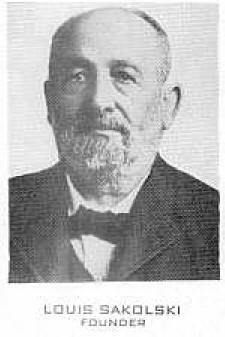 Benjamin Krulewitch became president of the shul in the 1890s. Despite the fact that B'nai Israel was chartered as a "Russian Congregation," many of the Harrison Street residents involved in the early days of the shul – Joseph Hyman, Joseph Stein, Koppel Hyman, Julius Krulewitch, Issac Jacob and Louis Sakolski – are listed in the 1880 Census as being of Polish descent. There is scarce information about the spiritual leaders of B'nai Israel in its early years. An 1895 newspaper article states that while no rabbi was employed for some years after the congregation was founded, Rev. 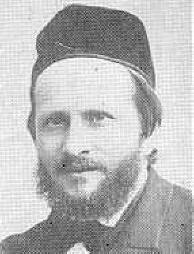 Moshe Shimon Sivitz was the rabbi for a time in the 1880s. He left to become Chief Rabbi of Pittsburgh. Rev. 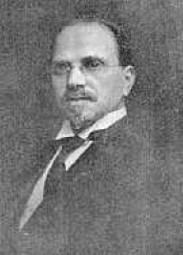 Abraham Levinson was B'nai Israel's rabbi during the congregation's formative years from 1890 to 1912. In the 1880s, Baltimore City Directories list a Rev. Silverman (?) as a reader for the "Russian Orthodox" synagogue at Exeter north of Fayette Street. This roughly corresponds to biographical information that states Tanchum Silberman was the chazzan of B'nai Israel from October 1882 to October 1885. He was later associated with Mikro Kodesch and Shearith Israel congregtions. 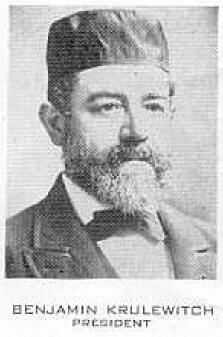 Other B'nai Israel chazzans in the nineteenth century included Reverend Moses J. Braude and a Cantor Davis. Approximately 10,000 Jews lived in Baltimore in 1880. In the next twenty years the number increased to 25,000, largely due to an influx of Jews from Eastern Europe. Starting in the 1890s, Baltimore's earlier German Jewish congregations moved out of East Baltimore and the downtown area. In rapid succession, Baltimore Hebrew (1891), Oheb Shalom (1893), Har Sinai (1894) and Chizuk Amuno (1895) moved to the near Northwest section from Lanvale Street to North Avenue, McCulloh Street to Bolton Street. In 1903, Shearith Israel joined the other four German Jewish congregations in the same northwest neighborhood. This exodus allowed B'nai Israel to expand by purchasing the former home of Chizuk Amuno on Lloyd Street. Chizuk Amuno, at the time an Orthodox congregation, sold their home of less than twenty years to B'nai Israel for $12,000. On September 10, 1895, the congregation held services at 27 Lloyd Street for the first time. B'nai Israel never moved from the old neighborhood and remains the last active synagogue in the East Baltimore/downtown area. On June 8–9, 1898, Simon Reif and Cantor Braude of B'nai Israel participated in the founding of the Orthodox Union. B'nai Israel was one of approximately fifty congregations in the United States and Canada that sent delegates to the founding convention of this organization in New York. Called the "Russiche Shule" or Lloyd Street Synagogue by natives, B'nai Israel flourished during its first fifty years on Lloyd Street. The synagogue was a center of Jewish life in the first half of the twentieth century. 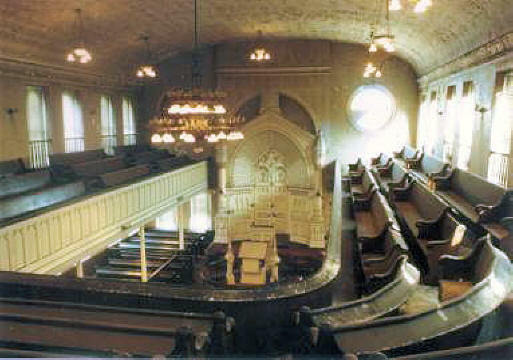 Hundreds, if not thousands, of simchas took place in the synagogue from 1895 to 1945, the golden era of B'nai Israel. Many families throughout Baltimore have relatives that were either married or bar mitzvahed at B'nai Israel. B'nai Israel was also known as a center for learning and piety. 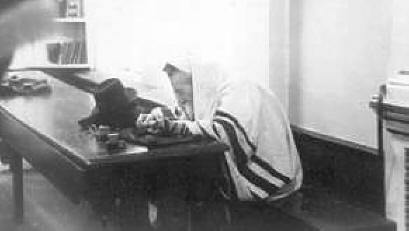 Day and night study took place in the Bais Hamedrosh. There is no record of a hired spiritual leader for the congregation from 1912 to 1930. The congregation was made up of learned men who conducted the affairs of the synagogue and turned B'nai Israel into a true house of study. 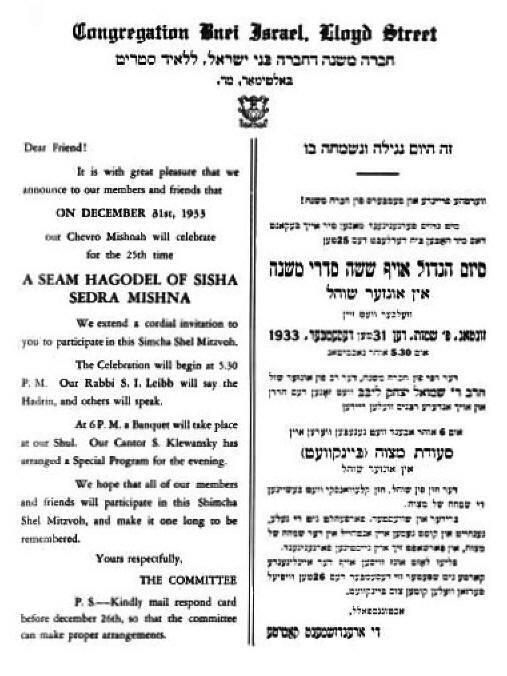 A surviving flyer announced in both English and Yiddish that a "Seam Hagodel," a celebration for the completion of the study of the mishna, took place on December 31, 1933. This was the twenty-fifth time that the members of B'nai Israel had accomplished this achievement! 1933 Flyer in English and Yiddish Announcing a "Seam Hagodel"
B'nai Israel was well known for its devout and scholarly members. At the Chevrah Mishna and Chevrah Gemorah study groups, men would sit on benches around long tables discussing Jewish law day and night. 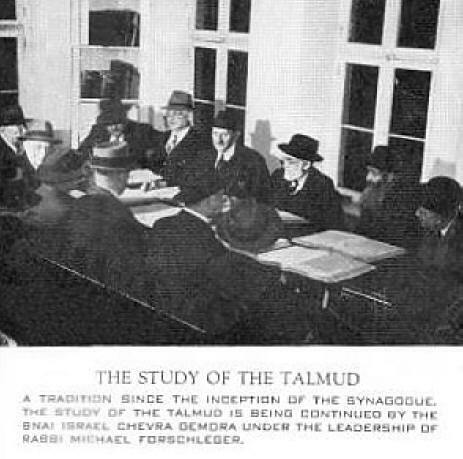 Rabbi Michael Forschlager, a noted scholar, led study groups for many years at B'nai Israel. In 1930, Rabbi Samuel Liebb became the spiritual leader of B'nai Israel, but he had moved on to Beth Hamedrosh Hagodol Agudas Achim by 1936. 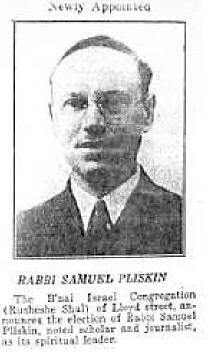 In 1939, Rabbi Samuel Pliskin, was selected as rabbi. He would make B'nai Israel his life's work, continuing in this position for nearly forty years, the longest tenure of any spiritual leader in the history of the congregation. Rabbi Pliskin was born in Glenbokie, Poland in 1913 and studied under the Chofetz Chiam in Radin, Poland. He was a noted scholar and journalist, leaving Europe just prior to the Nazi conquest of Poland. His early years at B'nai Israel coincided with the "tail end of East Baltimore's Jewish heyday." Rabbi Pliskin's Friday night Torah lectures attracted Jews from all over East Baltimore. He also wrote torah commentary for a Yiddish newspaper, Der Amerikaner, and was active in Vaad Hatzalah, an organization that worked to rescue many European rabbis and their students who fled to the Far East during World War II. Rabbi Pliskin's first Rosh Hashanah message to the people of Baltimore was filled with trepidation and fear. The world was on the verge of World War II, the fate of European Jewry was darkening, and Eretz Israel was hampered by Britain's "White Paper." He stated, "A thick black question mark surrounds the planet Earth and its inhabitants!" Yet, he called for an awakening at the sound of the shofar and prayed "May the Lord scatter the dark clouds and may He in all His mercy cause the sun to shine upon His world. May He purify the hearts of all people and the conscience of their rulers, in order that they may rebuild what they have destroyed and make the mourners rejoice again." Throughout this difficult time, Rabbi Pliskin was a shining light at B'nai Israel as he upheld the great tradition of his congregation. He became so much a part of the fabric of the shul that by the 1950s, B'nai Israel was no longer called the "Russiche Shule," but more appropriately, Pliskin's Shul. As the numbers of Jews living in East Baltimore decreased rapidly after World War II, B'nai Israel became the sole Jewish outpost in the wilderness. The sons, daughters, and grandchildren of immigrant East Baltimore peddlers and storeowners became lawyers and doctors and professional leaders. They followed the American dream moving out to suburban neighborhoods, leaving behind the remnants of Jewish East Baltimore. Between 1945 and 1974, twenty-one East Baltimore congregations disbanded, merged with other congregations or moved from East Baltimore to the northwest suburbs. But some Jews stayed behind, and B'nai Israel served their needs. Albert Hoffman, the president of the shul for three decades, was committed to keeping open the shul where he grew up. B'nai Israel welcomed all. Rabbi Pliskin was meticulously Orthodox, but he did not question the level of observance of his congregants. He said, "When a long-lost child comes home, parents do not ask questions. No investigating. No discussing. The Mother and Father always care." Some who had not attended religious services for years were attracted to B'nai Israel and later became observant. Another reason why B'nai Israel remained was that according to the Talmud, the one surviving shul for a city must be protected and preserved. Without B'nai Israel, the Jews who stayed in East Baltimore and downtown would have no place to pray. It was an obligation for this last shul to remain when all the others had left. On November 23, 1978, Rabbi Pliskin passed away. Rabbi Morris Landsburg succeeded him. Over the next few years, the shul that only charged $12 for membership dues and did not sell seats on the High Holidays was literally falling apart. The beautiful second floor sanctuary was open to the elements and pigeons roosted in gaping holes in the ceiling. The few who came to services prayed in the lower level Bais Hamedrosh, the former center of learning for the shul. There was little hope that B'nai Israel would survive into the twenty-first century, but brighter days prevailed. A new lease on life was granted to the building, as well as a second chance for the congregation. These words were spoken at the rededication of B'nai Israel on December 20, 1987: "We pay tribute today to a group of dreamers – no more than a handful of people. They have a dream that what once was can yet be again. 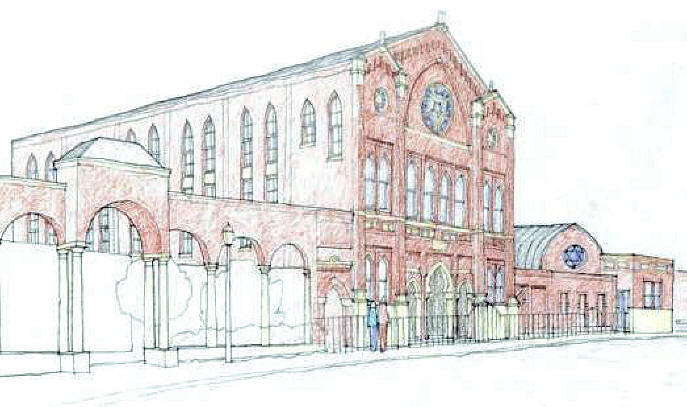 They look not only to this shul's past with pride, but look to this shul's future with hope." Efforts to restore B'nai Israel began in earnest in 1979. 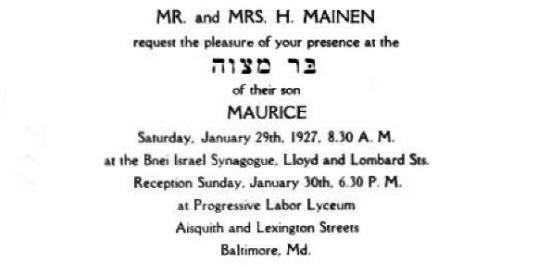 Mrs. Helen Sollins, an oral historian at the Jewish Museum of Maryland (then called the Jewish Historical Society), visited B'nai Israel when her husband, Leonard, had gone to the shul to recite kaddish. She ventured upstairs during the services and was devastated by the condition of the sanctuary. Her family attended B'nai Israel during its glory years and her grandfather, Issac Shuman, was among the many who studied Talmud here. She tried to convince the Jewish Historical Society to renovate the building, but that organization was still struggling to maintain the Lloyd Street Synagogue up the street. At a reception in 1981 promoting the TV show "Masada," she approached "Mimi" DePietro, a city councilman representing East Baltimore, for help. She pleaded that B'nai Israel was our Masada – the last stand for Jewish East Baltimore. Councilman DePietro helped convince Mayor William Donald Schaefer that city efforts were needed to halt the deterioration of this historic structure and funding was secured for a temporary roof. With city support for the project, others provided backing and financial assistance. The Associated Jewish Charities helped to raise funds. Robert Weinberg, the Jewish Historical Society Vice President, included B'nai Israel in his plans for a Jewish Heritage Center taking in the old Lloyd Street Synagogue, B'nai Israel and a new museum building. State historic preservation grant funding was obtained to help restore B'nai Israel. The synagogue itself raised over $75,000 to further these efforts. Ownership of the historic building was turned over to the Jewish Historical Society, which in turn leased the building back to the shul for $1 a year for the next 99 years. The Jewish Historical Society would maintain the exterior and conduct tours of the building in conjunction with activities of the museum, while the congregation would continue to maintain the interior and hold regular services in the restored building. Restoration work under the direction of Kann and Associates, architects, was completed in December of 1987 and the restored B'nai Israel Synagogue was rededicated on the sixth night of Chanukah. While the fate of the building was no longer in jeopardy, the fate of the congregation was still in doubt. 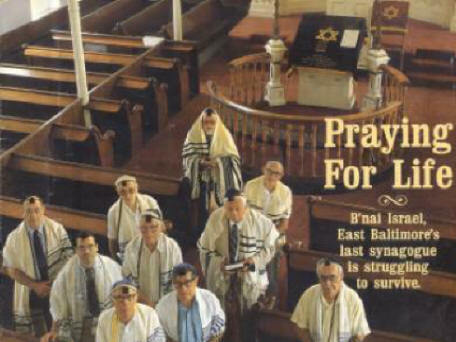 On October 20, 1990, the Baltimore Jewish Times featured a cover story on B'nai Israel's struggle to survive. The neighborhood around the shul was still declining. Hulking high-rise public housing projects loomed over the shul and the few remaining businesses on Lombard Street, East Baltimore's historic Jewish main street, but B'nai Israel refused to die. S. Leonard Sollins was elected President of B'nai Israel, taking over the efforts of Albert Hoffman, who kept the synagogue functioning during its darkest of times. 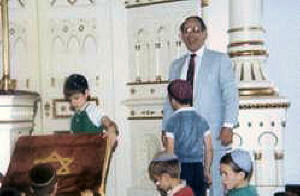 Under Mr. Sollins' leadership, Jews with family ties to B'nai Israel returned to attend services. Others who stopped by to see the beautiful building and experience a traditional service were so welcomed by congregants that they stayed on and became members, regularly participating in weekly services. Visitors to the Baltimore staying at downtown hotels or attending conventions found B'nai Israel when looking for a place to attend religious services. Students interning at Johns Hopkins Hospital or studying at downtown campuses joined regular services. Special services were held for veterans groups and men's clubs. When Cantor Abraham J. Denburg and his choir performed, hundreds found their way to East Baltimore's last shul. 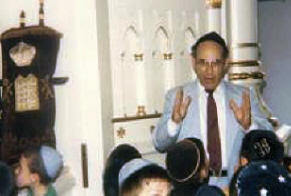 For a short time after the building was renovated, Rabbi Murray Gershon spearheaded efforts to re-build the membership. Later Rabbi Seymour Essrog was hired to read the Torah on Saturday mornings and provide a weekly sermon. Many families that had been affiliated with former congregations led by Rabbi Essrog held simchas on Lloyd Street. Rabbi Essrog personified B'nai Israel's welcoming atmosphere, making everyone feel at home. When Rabbi Essrog left B'nai Israel in 2000 to lead the Adat Chaim congregation in Reisterstown, a young rabbi studying at the University of Maryland Law School, Shraga Goldenhersh, was hired. In his short tenure, Rabbi Goldenhersh inaugurated the first Friday night Shabbos service to be held at B'nai Israel in more than twenty years. In January 2002, Rabbi Gershon Grayman became B'nai Israel's spiritual leader. Under his leadership, in addition to regular Saturday and Sunday morning services, special Friday night services were held once a month, attracting a diverse crowd. Other events taking place under Rabbi Grayman's tenure included annual Chanukah and Purim parties, a special Tu B'shevat seder, guest scholars for the annual Pearlstone Kallah, field trips to Jewish sites in New York, Washington and Philadelphia, an annual B'nai Israel day at Oriole Park at Camden Yards, and the 130th Anniversary Banquet – the first major banquet hosted by the congregation in thirty years. In September 2005, Rabbi Alan Yuter came to B'nai Israel. A member of the Orthodox Rabbinical Council of America, Rabbi Yuter formerly served as rabbi of Congregation Israel in Springfield, New Jersey, and was a professor of history and Jewish studies at Touro College. A prolific author and philosopher who writes on religious themes in Biblical and Jewish law and contemporary Jewish thought, Rabbi Yuter penned Holocaust and Hebrew in 1983. His many scholarly articles and essays have appeared in numerous important prestigious journals including Judaism, Midstream, Jewish Political Studies Review, and others. Rabbi Yuter moved into a house in Little Italy to be within walking distance of B'nai Israel. In order to be a full-fledged shul for downtown neighborhoods, Rabbi Yuter insisted on weekly Friday night services and mincha services for Shabbos. He conducts learning sessions on Sunday after morning services, Tuesday night and Wednesday afternoon. B'nai Israel no longer struggles to survive and the congregation is growing. Membership is over 200 families. An outreach program has begun to meet the needs of an estimated 5,000 unaffiliated Jews residing in downtown and waterfront communities. A Jewish Community and Education Outreach Center adjacent to the synagogue is on the drawing board. A multi-purpose room will allow the shul to expand educational programs, hold special events and host celebrations. The final chapter of the torah ends with the death of Moses at the age of 120, but the children of Israel – B'nai Israel – live on. After 130 years, Baltimore's historic B'nai Israel congregation has become a new center for Jewish life in downtown Baltimore. From generation to generation, from strength to strength, B'nai Israel lives. Click here for more information about our architecture.